Objectives: Low back pain (LBP) is one of the most prevalent complications of pregnancy, which can cause significant disabilities. However, data on the intensity of and disability caused by LBP during pregnancy are rare. The purpose of this study was to evaluate the severity of and disability caused by LBP, and compare them in different trimesters, and identify risk factors. 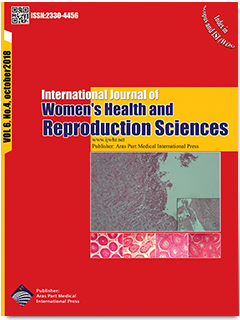 Materials and Methods: This cross-sectional study was conducted in 2013 on 514 pregnant women. A questionnaire on demographic information, severity of LBP (based on VAS), and the Oswestry disability scale was filled out by the participants. Data were analysed by Mann-Whitney, one-way ANOVA, and linear regression using SPSS software. P value below 0.05 was considered to be statistically significant. Results: In total, 69.09% of participants had LBP. The mean severity of visual scale pain was 38.2 ± 10.88 and mean disability due to LBP was 35.38 ± 18.30. The highest severity of pain, attributed to the second trimester, was 40.8 ± 21.7 and the highest disability score, 37.13 ± 18.81, was observed in the third trimester. In total, 77.1% of pregnant women studied with LBP had moderate to severe disability. There were meaningful associations of gestational age, parity, and previous chronic LBP with disability due to LBP (P value < 0.05). Conclusions: LBP during pregnancy is very prevalent and causes moderate to severe disability in the majority of pregnant women.